Kerstin Godschalk is a critic, curator and cultural manager based in Berlin. Since 2014 she is Artistic Director at HB55 Kunstfabrik, a 7000 sq. m. creative hub housing over 200 artists and creative producers. On 600 sq. m. she organises exhibitions and cultural events with the local tenants. Inspired by H. Lefebvre’s vision of human space as a product of ociety always contested by interactions, she collects emerging viewpoints under the framework of “L’espace de l’espèce”. Cutting through established art disciplines, viewing habits and approaches, she opens up multimedia spaces for interdisciplinary encounter and interactions speaking to all senses. By moulding control structures, new pathways are shaped for the reflection on existing and the creation of new social realities. During her studies in Cultural Sciences her focus lay on art sociologist approaches. Her research led her to live and study in Argentina. With Andreas Siekmann, Alice Creischer and Max Jorge Hinderer she then worked first as an intern at the House of World Cultures Berlin, before accompanying them with their exhibition “The Potosí Principle” to Bolivia and the Museo Nacional de Arte (MNA)/ Museo Nacional de Etnografia y Folclore (MUSEF) in La Paz. Since then- post-colonial studies, phenomena of globalisation and current social issues are focal points in her curatorial praxis. © Goethe-Institut / Max Mueller Bhavan As cultural manager she was Head of Production at the concert agency Handshake Booking, Berlin, and of Stattbad Wedding, Berlin. This professional experience enhanced her inter-disciplinary and multi-medial approach and led her to combine visual with performance arts and music in her future as a curator. 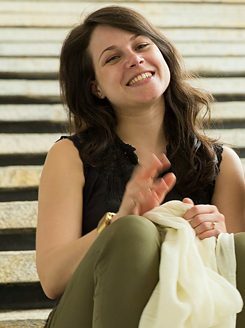 From 2013 until 2015 she worked as curatorial assistant to Anselm Franke and project coordinator for the exhibition series “Anthropocene Observatory #2-4” at the House of World Cultures. Throughout the past year, she published articles and gave talks in several occasions. In the summer of 2015 Kerstin Godschalk was invited to take part in the first Berlin Food Art Week. The exhibition “LEBENSMITTELpunktKUNST” reassembled international artistic positions that in times of food courts, Global food and ethically correct healthy meals conveying sense and sensibility of nutrition in today’s society. The exhibition was accompanied by a range of interactive performances. From the moment of its inauguration until its closing event people could eat and share food on different occasions. A long table was located at the heart of the exhibition space and served as an invitation to enter a dialogue and reflect upon our consumer behaviour. The Berlin Food Art Week will take place in a two-year circle. As Kerstin Godschalk’s personal interest lies in the articulation of emerging spaces, she is intrigued to find creative positions which instead of following the idea of escape are broadening cultural perspectives. In collaboration with Forager Collective she would like to seek local positions, which she could then integrate in the Berlin Food Art Week of 2017. 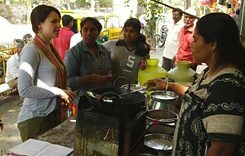 Her research is driven by the question of whether life and eating on the streets of Bangalore is so different from Berlin. Which commonalities can be detected in a world of global over-shaping, and consequently which traditions resist and persist? In particular she would like to filter local motivation, demand and the social function of artistic debates on that issue. She will contribute to the Forager Magazine with an essay on her findings. © Kerstin Godschalk “The smell of wood, the air is filled with forest. The scent of roses lingers yet none are in sight. Only the infinite width of the country at your feet. Birds chirping blends together with the rattling and hissing of the moving train. The country is spreading hazily. The heat - shimmering. A hot airstream blows in my face, dances softly around my feet. Four weeks of India – what a rush! Those are the first and the last lines I wrote down during my stay in Bangalore. On my way back from Mysore, where the residents Christoph, Maureen and I went for a final trip. Even today - one month after my return - I am still lost for words to properly describe the overwhelmingly, insanely beautiful time that was worth every minute of it. The Goethe-Institut, Bangalore has built up a fantastic residency programme; one that allows for the necessary freedom to develop your own project independently on site while at the same time being steered in the right directions to discover the fertile socio-cultural soil and expand your own network. To me as a newcomer it appears as if when accessing Bangalore, you access India; a very modern, young India. However this is also the melting pot of all cultures, all religions, all languages, regions and shapes from modern to orthodox conservative. It appears as if everyone here is aware of their traditions and their surroundings, with everyone shifting gears, adjusting in a chameleonesque manner adapting to whichever part of the town they currently pass through. Every day, every district offers up completely different, previously not encountered worlds ready for you to eagerly absorb while at the same time leaving you high and dry, unable to compartmentalise the perceived – in a constant state of suspense and uncertainty. Every minute, every second you experience something altogether new. The instant that you start thinking `now I get it , `I know exactly how to handle this´ you find yourself in utterly strange circumstances. You can never stop to concentrate on taking everything in, to make coherent conclusions, to comprehend and carefully but not restrained, act accordingly; at no given time. © Kerstin Godschalk To zone out is rather difficult, to simply drift through the day nearly impossible. You have to keep up with the city’s pace otherwise you are left behind. However I never felt threatened or restricted by this imposed rhythm and hub of unfamiliar worlds. Something that – especially given the fact that I am a woman – definitely was of great concern to me in advance. Long pants, t-shirt and the wrapped-around scarf never inflicted any restraints but rather became a shield against the dust, a safe haven and above all respect for other cultures. Everything surrounding me seemed so exciting and striking that it simply felt absolutely unnecessary to cause any additional attention. Led by the urge to blend in with the masses I came to Bangalore as an observer. Yet, it was a thoroughly unfamiliar feeling that words failed me to express where I found myself. Two weeks in I finally got the feeling that I could possibly comprehend what actually happens in this gigantic city. But how was I supposed to go back to all those places within the two remaining weeks? How to communicate with street vendors that rarely speak any English? I simply had to get used to the idea that my initial research idea on street food would cease to be realised in its original sense. 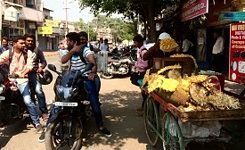 It became evident to my hosts – the Forager Collective – and me that my confusion laid something bare: Contrary to my own consumer habits in Berlin, street food in India/Bangalore constitutes a brief moment of pause in the constant buzz. © Charlotte von Thaden Street food meant resting, stopping on the side of the road, lingering in the stream of the everyday of the city. My thematic focus thought up from afar suddenly became a point of entry to navigate and access this city; bringing it closer to me. 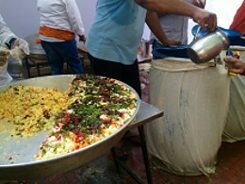 Street food is an access point for anyone that sets foot into Bangalore. This is where you arrive and dive into a different world and food culture. A space where you communicate without words, contemplate things with a distance to the coming and going, with a distance to the hustle and bustle of the roads regardless of the limitless hunger of the continuously spreading city. One develops trust knowing that this is a stable place. An entry point from where one can discover the city anew in its endless possible paths and ways. Controlled chaos: this city is bursting at its seams; you realise quickly that it has grown much too fast. It is overwhelmed and consumed by its own growth spurt. Yet its inhabitants have settled in, each in the microcosm that is their own district, they have established their routines, built their access points. Each district following their own logic and culture. 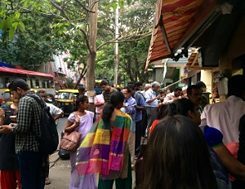 The diversity of Bangalore’s citizens from all over India and the rest of the world causes constant new impulses to enter the city – continuing its staggering growth. And the variety of cultures, languages and influences is especially reflected in the food that is offered. There has always been a variety of North Indian food, the city’s food map has spread much further than the borders of Karnataka. Automatically tech firms and the IT crowd brought in a westernised menu and life style. Consultants come with high demands, corporates with their culture. Food trucks selling hamburgers and hot dogs are setting up in the office districts and in front of shopping malls, catering to a different kind of crowd than the carts on the streets, stacked with traditional Indian food and snacks. © Kerstin Godschalk India: land of contrasts; for me not just between rich and poor. Bangalore shows me another face. I have experienced and witnessed what you couldn’t pack into one night anywhere else. I have roamed worlds in just a few hours; have left my trace and in return taken unforgettable impressions with me. I spent an evening in a traditional sari, mingling with the conservative wedding party of 2800 guests, listened to grunge music at a preview taking place in a hip co-working space with drinks being poured by French barkeepers; turned night into day in a family home turned into a start-up office. Between old furniture and decorations, in between post-its and whiteboards, I suddenly found myself strangely close to my Berlin home, the same music, the same rush from heated, inspired discussions. Yet, again withdrawn, the balcony put forward hammock and stories of tigers and the only living black panther in India. One thing is clear: the city is in constant motion, yet for food things come to a momentary pause. The hectic gaze disappears from people’s eyes and calm sets in. 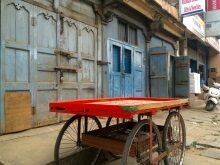 Even if one eats alone, you stand together at the cart, withdrawn from the rush and enjoy.